A year ago I did something completely out of character for me. I stepped out of my comfort zone and did something frightening. I still remember that unsettling feeling I had when I announced to my Facebook friends that my website, Beauteeful Living had gone live. O-M-G! Why can’t I just let “good be” and just continue on my merry little way, living in my little bubble? Did I have to share a part of my life and creative passions online? A year into this creative process, I’m glad I didn’t let my inhibitions get in my way of starting this website. With this blog turning 1 today, I thought I’d share with you some insights and highlights of my 1st year of blogging. Ever since High School, I’ve identified myself as a writer. For years, I had thoughts about writing a memoir, giving insight to some of my experiences. But memoirs are extremely personal. Was I ready? In many ways, this 1st year of blogging has given me a taste of how it is to share things that are personal. Sure, writing about throwing a birthday party or decorating for a holiday may not be the most personal things in the world. But to me, they are personal. It takes a lot of WORK and time! The quality of content means the world to me. I rather put out 1 good post per week than 3 mediocre ones. I am so glad I stuck to my word about “not blogging just to blog” which I highlighted in my very first blog post (link here). If I don’t have anything interesting to say or share, I rather not post it. So yes, between writing posts, editing photos, reading other blogs, and social media, blogging indeed takes a lot of time. Time that I don’t necessarily have but do make a point to carve out. I started this website as a creative journey to document family events, special moments, and share projects that I’m passionate about. To me, Beauteeful Living is a portfolio of my favorite things. In the process of sharing snippets of things I love, I have been fortunate to be given some wonderful feedback. A big highlight is being nominated for 2 New Blogger Recognition Awards (Sunshine Award and Liebster Award) by fellow bloggers last year. Both took me by surprise. Other people besides my family and friends actually appreciate my posts? How S–W–E–E–T! I feel very honored. I came up with Beauteeful as a play on my nickname “Tee.” At first, I was afraid people would misinterpret it as me being pompous. That I think I’m beautiful and everything I have is beautiful. My 1st year of blogging was really about laying down the foundation of what Beauteeful Living represents. The brand, so to speak. I hope this blog continues to motivate me to start and complete projects that would otherwise have fallen into the “I could never do” category. Of course, sharing some of the special moments that my cozy family of four experience together will still be a part of this blog. Besides motivation and sharing experiences, another benefit of blogging the past year is being a part of the blogging community. What a friendly and supportive group! Did I mention talented? I find myself constantly in “awe” at the level of talent from the creatives in the blogging world. But more than feeling intimidated, I find myself feeling INSPIRED. I cannot close this post without sending a “BIG THANK YOU” to all my readers and fellow bloggers who have visited and supported this blog the past year. Your support has been a major factor in this little blog reaching a year old. I’m very excited for this second year ahead and hope that you continue to share this journey with me. To celebrate this 1 year milestone, my E-mail subscribers are entered in a raffle giveaway for a replica of a pillow cover I made recently (see here) as well as next week’s Beauteeful Find! P.S. They make great gifts! Here’s to stepping out of our comfort zones to live out our creative passions! With much appreciation, Tee. It is frightening to put yourself out there. It’s just one of the crazy things about blogging. 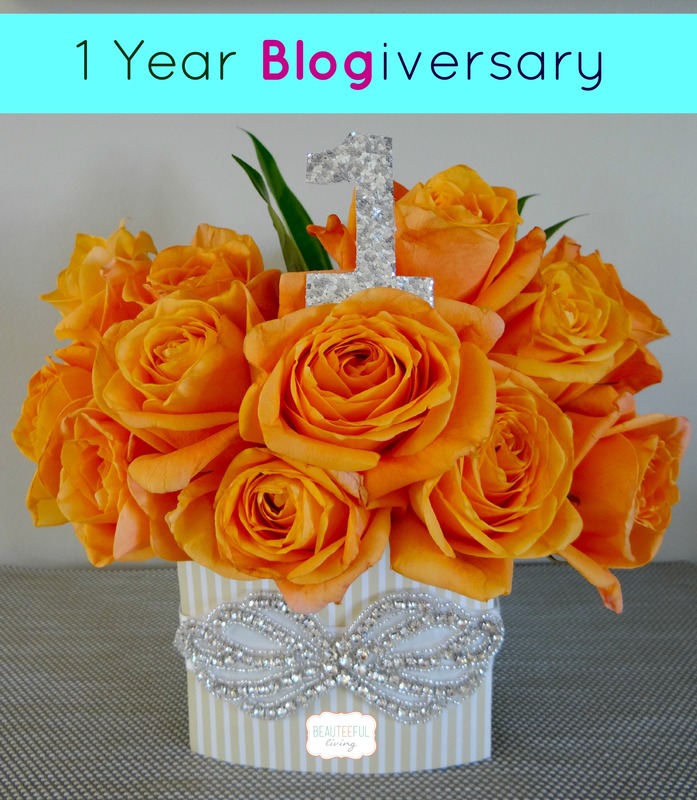 Congrats on your 1 year blogiversary! I always look forward to reading your posts. Congratulations. Thanks so much, Amanda. I appreciate your feedback. I’m new to your blog. Looks like you have done a lot in your first year. I look forward to seeing more from your blog. Congrats! Thanks so much for stopping by, Jamie! Congratulations! You should be very proud of your 1st year. You do a lot of things well here that took me much longer to figure out. Good luck on your 2nd year! Thanks so much, Valerie! Your kind words mean a lot to me. Your blog is wonderful! I like how you added your nickname to your blog’s title. I love the name Beauteeful Living! Congratulations on 1 year! Congratulations on 1 year anniversary. I enjoying looking at your blog for ideas for our home. From a non-blogger’s prospective, I really appreciate you sharing your insights into starting and continuing a blog. Sometimes I wonder, what it would be like to share thoughts and ideas on to a large audience but a lack of confidence in my writing skills keeps me from to doing this. You should be so proud that you didn’t let your apprehensions stop you. I hope to continue to read you blog for many years to come. Thanks so much, Dianne! Trust me, we’re all writers! Thanks again for your support. Wohooo! Happy 1 year!!!!! You have done some wonderful things, and continue to inspire me. I remember you posted you in the young house love forum that you just started your blog. I was excited to see your first post and the fresh way you were taking it on. You have continued to be that way. I agree that the community of bloggers has been amazing, and something that surprised me as well. I cannot wait to see what you create, where your blog goes, and see more from you in the next year of your blogs journey!